Hire the Club's Facilities for your business or social occasion. 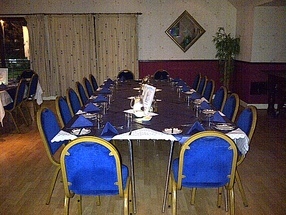 Cambusdoon Sports Club is available for hire for functions and events to members and non members. We are able to provide a flexible layout and it is suitable for both small and larger events. - Parties - Birthday, Christening, Engagement, Wedding Reception, Anniversaries, Retirement or anything in between! We have sought to keep the cost of hire at very reasonable levels and these represent great value for both members and non-members alike. To check out the current tariff and booking process click here. To enquire about facilties or to book a function then best to call the Clubhouse Team on 01292 442885 and they will work with you to answer your queries, confirm the booking and in turn to ensure your event goes smoothly. Alternatively initially email cambusdoonsportsclub@hotmail.co.uk with your query inclduing your contact telephone number and they will call you back to discuss your needs. Our new Resident Chef, Mrs Rhona Merli and her team can provide lovely home cooked meals for you. Why not pop in and give it a try. Phone to book in the first instance to Rhona on 07565 186668.